Ya Ali Madad! On the occasion of the commemoration of the great spiritually uplifting event of Idd-e-Ghadir, the first Imamat Day of our first beloved Holy Imam, Amirul-Mu'mineen, NOOR Mowlana Murtaza Ali (a.s.) and on the occasion of 135th birthday commemoration of our 48th Holy Imam, Noor Mowlana Sultan Muhammad Shah (a.s.) on Friday, November 2, 2012, please accept our heartfelt felicitations! What is the relationship between Iman and Islam? A Murid and a Mu'min? In order to understand the Ismaili doctrine of 'Returning to the Origin', I would like my readers to first look the majesty, might and power of the Niagara river, and the fabulous Niagara Falls via a live webcam. Turn the speakers on and you will get a feeling that you are moving with the water in this river and over the Canadian 'Horseshoe' Falls. Here is a link to the 'Facts about Niagara Falls'. The Niagara River is just 12,000 years old and drains the water from the fourth Great Lake, Lake Erie, to Lake Ontario. The journey of water from Lake Ontario continues through the St. Lawrence Seaway and ends in the Gulf of St. Lawrence which is a part of the Atlantic Ocean. With respect to the hydrologic cycle, this phase shows the return portion of the journey to the ocean. "(Then Hazar Imam referred to the simile of the river and the ocean. Hazar Imam quoted the ayat "'Innaa lillaahi wa- 'innaaa 'ilayhi raaji-'uunn" (Holy Qur'an 2:156)). Shariati people do not understand this. These are things that must be understood, that according to the Ismaili religion, Allah is the Ocean. Ali, during his life on earth, was the river separated from the Ocean of the Almighty—separated from it and running towards it—overcoming all material resistances and running towards its origin. The haqqiqati people should understand the meaning of this ayat — from a haqqiqati point of view, this ayat means more than all the rest of the Qur'an. Then, of course, Pir Sadardin and others have put forward the doctrine — namely that all mu'mins are small streams starting from the earth and joining the ocean with (via?) the river. These are doctrines of Ismailis. This is perfectly clear. There is nothing new. The perfect mu'min, after death, and Imam should not be separated, which means it is like a river which flows through the earth, stones, rocks, and various obstacles but reaches the ocean carrying with it all kinds of smaller streams. Now all of these have already been made clear by Ismaili writers and thinkers, and sifted and made clear and printed in Iran. These are the doctrines, the true heart of Ismaili religion." The above doctrine clearly shows that in our personal search and return journey, we, the Ismailis, chart our path to enter the Ocean of Reality through the Light (Noor) of Imamat. We are like small streams which become part of a mighty river which overcomes all the obstacles and enters into the Ocean of Reality. This doctrine clearly shows the Holy Imam, who is the bearer of Noor of Imamat, is fundamental pillar of support for us. Our Hazar Imam has taught us that through the Noor of Hazar Imam, the Noor of Imamat and the Noor of Noor Mowlana Murtaza Ali (a.s.), we should seek to come closer to He who is above all else. Part 3: What is the relationship between Iman and Islam? A Murid and a Mu'min? "One of the essential questions that was discussed at this early period, and upon which the various schools were divided, was iman. A number of related questions were raised such as the distinction between iman and islam, 'faith' and 'submission', and their connection. Another issue was whether there were degrees of faith. Al-Baqir, basing his views on the Qur'anic verse 49:14 — 'The Bedouins say "we believe". Say: you do not believe; rather say, "we have accepted Islam (aslamnaa). Faith has not yet entered your heart." '— made a clear distinction between iman and islam. For him iman included islam, but islam did not encompass iman." "Further details of the difference between iman and islam can be deduced from yet another question put to al-Baqir, when asked if he who witnesses that there is no God but God, and Muhammad is the Messenger of God, was a believer, al-Baqir replied: 'Then what about the duties imposed by God?'. As noted earlier, according to al-Baqir there are seven such duties, but walaya was the foremost around which all other revolved. Thus, for al-Baqir, true iman is directly related to the walaya of Imams; iman emerges from the belief in Imam. According to him iman, as distinct from islam, is belief in the prophets, messengers and imams of God with complete obedience to the Imam of the time." "Islam and Ismailism are built on Iman and Mu'min. Iman means faith. Mu'min is one who has faith. Mu'min who has true faith does not mean to be a philosopher it means one who has got faith. If you have got no Iman there is no hope. Iman is a thing that one can get by praying for Iman, for that you have to go to Imam. There is no other way or short cut to it." A mu'min is a murid who has enlightened his faith in the Holy Imam. This is a much greater achievement than just accepting the Imam with one's tongue and thoughts. All mu'mins are murids but not all murids are mu'mins. There is meritocracy in personal search! In one of his firmans, Noor Mowlana Sultan Muhammad Shah has taught us that "Faith is Light" ('Iman Noor chhe'; Source: Ruhani Raaz Gujrati firman book, p. 59; Jamnagar, 4th April 1900). This is the reason that I am categorically stating that a mu'min is a person who has enlightened his faith with the Noor of Imamat. In the Ismaili Tariqah, we go to the Imam of the time for iman (faith). 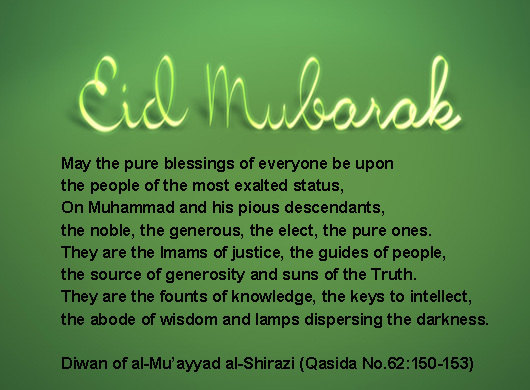 In this context, please reflect on the first Dua which the Holy Imam bestowed upon the global Jamat in his Golden Jubilee Irshad: "I pray for the strength of the faith of every Murid". I think that this act is consistent with the meaning of the sixth Divine Name Al-Mu'min: The infuser of faith. The Holy Imam infuses the Light of faith into a mu'min. In my mind, first we accept the Ismailism, and then we follow the seven pillars of Ismailism, pray to the Noor Mowlana Hazar Imam for iman, get an infusion of iman from the Noor of the Imam, and with ardent practice of faith let these rays of Light of faith blossom in our whole being. This is, in a simple way, the process of transforming from a murid into a mu'min! Al-Hamdullah! "Ya Imamaz-Zaman, Ya Mawlana, Anta Quwwati, Wa Anta Sanadi, Wa 'Alayka Tikali, Ya Hazir Ya Maujood, Ya Shah Karimul Hussaini, Antal Imamul Haqqul Mubeen. Allahumma Laka Sujoodi wa Ta-'ati." O Allah to You is my prostration and obedience." "When you bow down in the worship of God, you must implore Him to help you attain your true home. Like a child separated from the mother, one must yearn for reunion with God." "Allahumma ya mowlana antas-salaam, wa minkas-salaam, wa ilaika yarjaus-salaam, haiyyina rabbana bis-salaam, wa adkhilna daras-salaam, tabarakta rabbana wa-ta'laita, ya zal jalali wal ikram"
"O God! O our Master! You are eternal life and everlasting peace by Your essence and attributes. The everlasting peace is from You and it returns to You. O our Sustainer! Grant us the spiritual life of true peace and usher us into the abode of peace. O Glorious and Bounteous One! You are blessed and sublime." The beauty of this prayer is that it is a part of our Holy Dua and we say it three times a day! This prayer which is given to us by our Holy Imam also points to the ultimate purpose of our religion which is to taste the experience of visiting the abode of eternal peace while we still physically alive and then enter the eternal abode of peace when we physically die from this world! First of all, I would like to draw the attention of my readers that the prayer, 'Astaghafirullahi Rabbi Wa Atubu Ilayhi' is in Arabic and it has five words. Therefore, in the recitation of this prayer, it is of utmost importance to say these words distinctly and in a sequence. We are a global Jamat and our brothers and sisters who are well versed in Arabic and Farsi say this tasbi by pronouncing these five words distinctly but there is a problem with our brothers and sisters who split the word 'atubu' and attach portions of this word to 'wa' and 'ilayhi'. In the latter case, the last three words sound like 'waatu bu'ilahi'. This needs to be corrected and I humbly request all the readers to please listen to the mp3 track and correct this error. Let me explain why this is important. "Tawbah has many meanings and the final and most exalted one is to return to Allah and annihilation in Allah, as is clear from the wisdom-filled verse (2:54): "So return to (the presence of) your Creator and slay your souls." That is, the successful return to God is to die spiritually before the physical death. And this is the annihilation in God." TABA (verb) ~to repent, to be penitent, to do penance; (with preposition 'ala) to turn towards someone (in forgiveness); (with preposition 'ila) to turn towards someone in penance. One of the imperfect active derivative was yatubu. TAWWAB noun masculine (n.m.) ~One who turns (Divine attribute); (plural) ones who repent (2:222). At-Tawwaab is the 80th Divine Name and the tasbi derived from this name is Ya-Tawwaab. I hope the above knowledge will motivate us to recite the 'Astaghafirullahi Rabbi Wa Atubu Ilayhi' correctly and make us fully aware that we are also supplicating not only for forgiveness of the sins but also for returning to He Who is above all else. Prayers for Returning to Our Origin. With this understanding, let us start to recite the Astaghafirullahi Rabbi Wa Atubu Ilayhi tasbi (Verily, I sincere seek the forgiveness of Allah, who is my Lord and Sustainer, and I turn to Him in repentance). Let us actualize Noor Mowlana Hazar Imam's the Golden Jubilee prayer: 'And I pray that you may live in peace and with spiritual enlightenment to guide you'. Our goal is to become light borne and use the Power, Grace, Barakat and Peace of the Light of the Eternal Ali (a.s.) to create a better world for the whole humanity!